Mohammadi, G., Salehi Sardoei, A., Shahdadneghad, M. (2014). Improvement of the vase life of cut gladiolus flowers by salicylic acid and Putrescine. 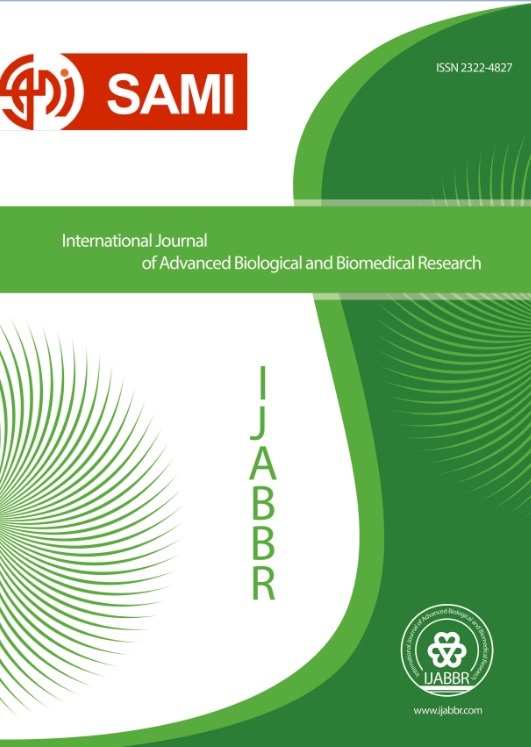 International Journal of Advanced Biological and Biomedical Research, 2(2), 417-426. Gholam Abbas Mohammadi; Ali Salehi Sardoei; Mojghan Shahdadneghad. "Improvement of the vase life of cut gladiolus flowers by salicylic acid and Putrescine". International Journal of Advanced Biological and Biomedical Research, 2, 2, 2014, 417-426. Mohammadi, G., Salehi Sardoei, A., Shahdadneghad, M. (2014). 'Improvement of the vase life of cut gladiolus flowers by salicylic acid and Putrescine', International Journal of Advanced Biological and Biomedical Research, 2(2), pp. 417-426. Mohammadi, G., Salehi Sardoei, A., Shahdadneghad, M. Improvement of the vase life of cut gladiolus flowers by salicylic acid and Putrescine. International Journal of Advanced Biological and Biomedical Research, 2014; 2(2): 417-426. The effects of salicylic acid (SA) and Putrescine (Put), on cut Gladioluswas studied. SA (0, 150, 300 and 450 mg l-1) and Put (0, 100, 200 and 300 mg l-1), their combinations were tested as preservative mixture. This study was conducted in a factorial experiment with complete randomized design on 192 Gladioluscut flowers in horticulture laboratory of agriculture faculty of Islamic Azad University, jiroft branch. The recorded traits included Vase life, Flower Diameter, SPAD, flower diameter, flower petal wilting, percent of floret blossoming, total soluble solids (TSS) and Solution uptake. the results shown effect of different levels of PUT (p<0.01) and interaction of PUT×SA (p<0.05) on flower diameter. Mean comparison indicated that increased level of PUT and the concentration of 300 mg l-1 of this polyamine result in increase of flower diameter. Increasing salicylic acid concentration up to 300 mg/l-1 had positive and significant effect on soluble solids but application of concentrations above 450 mg/l-1 reduced soluble solids level. Water uptake in the absence and presence of 100 mg/l-1 PUT was 168.4 ml and 170.2 ml respectively which is not significant but was elevated to 184.4 ml when PUT concentration was increased to 300 mg l-1. Alverez, A.L (2000). Salicylic acid in machinery of hypersensitive cell death and disease resistance. Plant Mol. Biol. 44: 429–442. Bouchereau, A., Aziz, A., Larher F and Matin-Tanguy J (1999). Polyamines and environmental challenges: Recent Development. Plant Sci., 140: 103-125. Casiro, R.A and Marton L.J (2007). Targeting polyamines metabolism and function in cancer and other hyper-proliferative diseases. Nat. Rev. Drug Disco., 6: 373-390. Enyedi, A.J., Yalpani, N., Sliverman, P and Raskin, I (1992). Signal molecule in systemic plant resistance to pathogens and pests. Cell 70: 879–886. Edrisi, B (2009). Payam-e-Digar Publication. pp. 150. Gast Karen, L.B (1997). Kansas State University (KSU). Harper, J.R and Balke, N.E (1981). Characterization of the inhibition of K+ absorption in oats roots by salicylic acid. Plant Physiol. 68: 1349–1353. Hayat, Q., Hayat S., Irfan, M and Ahmad, A (2009). Effect Of Exogenous Salicylic Acid Under Changing Environment: A review. Enviro. and Exp. Botany, article in press. Iman Talaat, M., Bekheta, M.A and Mahgoub, M.M (2005). Physiological response of periwinkle plants (Catharanthus roseus L.) to tryptophan and putrescine. Int. J. Agric. Biol., 7: 210-213. Kakkar, R.K and Sawhney, K.V (2002). Polyamine research in plants-a changing perspective. Physiologia Plantarum, 116(3): 281-292. Khan, W., Prithviraj, B and Smith, D.L (2003). Photosynthetic responses of corn and soybean to foliar application of salicylates. J. Plant Physiol. 160: 485–492. Kumar, A., Altabella, T., Taylor, M.A and Tiburcio, A.F (1997). Recent advances in polyamine research. Trends Plant Sci., 2: 124-130. Mahgoub, M.H., Abd El Aziz, N.G and Mazhar, M.A (2011). Response of Dahlia pinnata L plant to foliar spray with Putrescine and Thiamine on growth, flowering and photosynthetic pigments American-Eurasian J. Agric. and Environ, Sci., 10(5): 769-775. Macnish, A.J., Leonard, R.T and Nell T.A (2008). Treatment With Chlorine Dioxide Extends The Vase Life Of Selected Cut Flowers. Postharvest Biol. Technolo. 50: 197-207. Popova, L., Pancheva, T and Uzunova, A (1997). Salicylic acid: properties, biosynthesis and physiological role. Bulg. J. Plant Physiol. 23: 85–93. Redman P.B., Dole, J.M., Maness, N.O and Anderson J.A (2002). Postharvest Handling Of Nine Specialty Cut Flower Species. Sci. Hort. 92: 293-303. Solgi M., Kafi, M., Taghavi T.S and Naderi, R (2009). Essential Oils And Silver Nanoparticles (SNP) As Novel Agents To Extend Vase-Life Of Gerbera (Gerbera jamesonii cv. ‘Dune’) flowers. Postharvest Biol. Technol. 53: 155-158. Srivastava, M.K and Dwivedi, U.N (2000). Delayed Ripening Of Banana Fruit By Salicylic Acid. Plant Sci. 158: 87-96. Shirasu, K., Nakajima, A., Rajshekar, K., Dixon, R.A and Lamb, C (1997). Salicylic acid potentiates an agonist-dependent gain control that amplifies pathogen signal in the activation of defense mechanism. Plant Cell 9: 261–270. Van Doorn W.G., Zagory D., Witte Y.D and Harkema H (1994). Effect of vase-water bacteria on the senescence of cut carnation flowers. Postharvest Biol. Technol., 1:161-168. Zencirkiran, M (2005). Effect of sucrose and silver thiosulphate pulsing on stem- base cracking and vase life in Leucojum aestivum L. flowers. J. of Hort. Sci. and Biotech. 80 (3): 332-334. Zencirkiran, M (2010). Effect of 1-MCP (1-Methyl Cyclopropene) and STS (Silver thiosulphate) on the vase life of cut Freesia flowers. Scientific research and Essays. 5 (17): 2409-2412. Mayak, S., Bradvo, B., Gvilli, A and Halevy, A.H (1973). Improvement of opening of cut gladioli flowers by pre-treatment with high sugar concentrations. Sci. Hortic., 1: 357-365. Serek, M., Jones, R.B and Reid, M.S (1994). Role of ethylene in opening and senescence of gladiolus flowers. J. Am. Soc. Hortic. Sci., 119: 1014 - 1019. Capdeville D. H., L. A. Maffia, F. L.Finger& U. Batista. (2003). Gray Mold Severity and Vase Life of Rose Buds after Pulsing with Citric Acid,SalicylicAcid, Calcium Sucrose and Silver Thiosulfate. fitopatologiaBrasileira 28:380-385. Dezhkam, H and Dezham, M (2010). Effect ofDifferent Concenteration of Salicylic Acid on the Vase Life of Different Cultivar of Rose. Proceedings of National Seminar Improvement and Development of Flowers &Ornamental Plants Market in Iran.Pp. 122. Nowak, J and Rudnicki, R.M (1990). Postharvest handling and storage of cut flowers, floristgreens, and potted plants, Timber Press, Portland, Oregan, USA. pp: 210. UpfoldS, J and van staden, J (1991). polyamines and carnation flower senescence: endogenous levels and the effect of applied polyamines on senescence. plant growth regulation.10:355-362.